My-Pet-Toys-And-Stuff: Do Show Dogs Influence our Pet Choices? Everybody loves a movie about a courageous Dog. TV shows and contests about pets hold us captive. A Collie named Lassie was a must see for 19 years (1954 -1973) on Television and in movies. Rudd Weatherwax was trainer and owner of Pal, the first Lassie. He eventually acquired the name and trademark. Pal and his descendants played Lassie for the whole 19 years. The movie, 101 Dalmatians, inspired a lot of families to adopt one for a pet. The 143rd Westminster Dog Show held dog lovers hostage in front of the TV set just a few weeks ago when “King” the wire-haired Fox Terrier from Brazil was selected as Best in Show. But are movies, TV shows and Contests the best avenues to decide on a pet for our households? Do we get an accurate background of knowledge to make an educated decision on a particular animal? 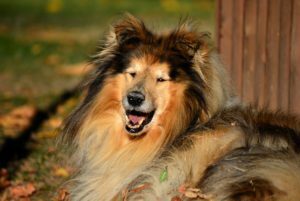 Lassie, the canine star of the long-running TV show of the same name, was played by several dogs. The first dog to portray the female star Lassie was actually a male, named Pal. Pal was an excellent actor, doing most of the stunts on the first take. Pal’s son, Pal Junior came next. Subsequent offspring of Pal; – Spook, Baby, Mire and Hey Hey played the heroine for the whole series. The Collie is a beautiful dog with an open, bright-eyed facial expression and a long flowing coat. She is a gentle dog and is very good with children. The Collie is an- all-around exceptional dog for a family. The breed originated in Scotland and Northern England and was used as a herd dog. The Collie is a strong, active, responsive dog, very intelligent, mild-mannered, and easy to train. Daily care includes lots of exercise and a daily brushing. 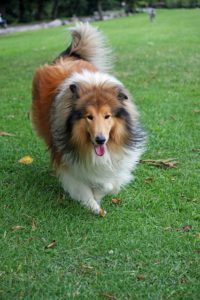 If you decided to get a Collie for the family pet based on the series, “Lassie” you would have probably made a good choice, considering temperament and ease of learning. But do not expect your collie to perform the gallant rescues that the TV Collie was specially trained to do. The movie was released in 1966 and immediately captured everybody’s heart. The story is pretty simple. The evil Cruella deVil is captivated by the dalmatian puppies and devises a way to get enough spotted puppies in order to make her a spotted fur coat. Of course the puppies owners thwart Cruella’s every move and she doesn’t get her coat and the puppies are saved. Real puppies weren’t trained for this movie. Animatronics were used to create the puppy antics. Nevertheless, people fell in love with the adorable puppies and after the movie release, sales of Dalmatians shot up. 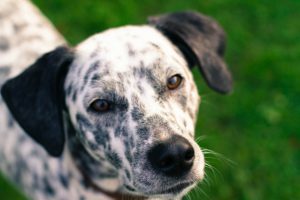 Families were not prepared to handle adult Dalmatians and many were given up to pounds and shelters, which led to many of the dogs being euthanized. 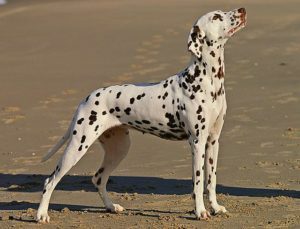 The Dalmatian is a medium to large dog, reaching 48 to 55 pounds and has a life span of 13 to 16 years. The origin of the breed is unknown. The name comes from Dalmatia, now called Croatia, on the shores of the Adriatic Sea. 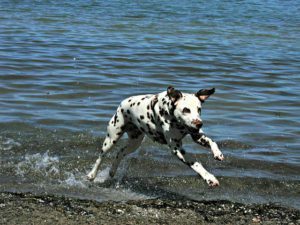 “Born to Run,” the Dalmatian started out as a coach dog- a hunting dog- a fire house dog and a circus performer. The Dalmatian can act from gallant to goofy. He is affectionate and good with kids, friendly with other dogs, but not a dog for apartment living. Dalmatians shed and need daily grooming. They have a high energy level and daily exercise is a must. This is a dog that was bred to run for miles and miles. In the days of horse drawn carriages, the landed gentry had Dalmatians run alongside the coaches for miles, and perhaps more than once a day. These dogs have an endless capacity for exercise. They are intelligent animals and need rigorous training. Their owners need training too, on how to manage them. 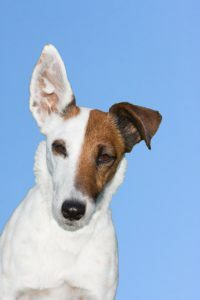 Finally, there is a possibility of deafness that runs in the breed. These are beautiful dogs, but can be more difficult to care for than most families can manage. February 11 and 12, Dog lovers were glued to their TV sets waiting to see if their favorite breed would make “Best of Show” this season. Some were happy and no doubt, some were not so happy when the Best in Show, “King,” a wire- hair Fox Terrier won the title. The Fox Terrier is a medium size dog.The male reaches 14 to 16 inches in height and will weigh 15 to 20 pounds. Females will reach 13 to 15 inches in height and will weigh 13 to 18 pounds. The coat is dense with twisted hairs. Th e hair grows thick and close together, so thick that when you try to part it, you cannot see the skin underneath. Wire hairs have an undercoat that is soft, smooth and short. 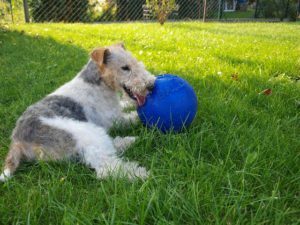 Fox Terriers are usually white with black and brown markings.The life span is around 15 years. Like most smaller dogs they present a bold, brave front. They are cheerful, lovable, enthusiastic and playful. They get along well with children and are devoted to family.They will get along with other dogs, if they have been properly socialized. Terriers are intelligent and can be taught to do tricks. They do have a dominant streak and are very energetic – which means that they need lots of exercise, both mental and physical. The dog’s owner must be 100 percent, all the time, firmly, his pack leader. Terriers need consistent rules to follow, with limits on what and what not to do. They are fine living in an apartment, as long as they have a vigorous walk or jog each day. Wire Hair Terriers were originally bred to hunt, coming from a mix of Daschund, English Hound, Fox Hound and Beagle. 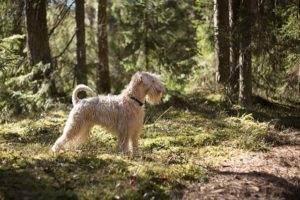 Farmers used them to stalk and kill small prey.They are one of the oldest Terrier types, dating back to the 17th Century. Up until 1984, all Fox Terriers were considered one breed, with two coat types: smooth and wire-hair. In 1985, the AKC recognized them as two distinct breeds. Wire Hair terriers can make good family pets. They are willing companions for that morning jog and that evening constitutional. They do not shed,which makes them wonderful pets for allergy sufferers They need to be brushed once a day and only bathed when necessary. The human being likes a certain amount of drama in his/her life. An activity that makes the heart race a little, the breathing come faster. It can be personal activity or the senses triggered by something we see. Action movies can give us a rush of excitement. We love movies where animals are pitted against what seem to be impossible situations, prevail and live happily ever after. But deciding on a pet based on the tricks the movie animal does is not the right way to go. Those animals are especially trained by professional animal handlers. You can’t expect your pet to perform like a movie star. Do your own research and select the pet that suits you and your family. Thanks to: Dog Breed Info; Dog Time.com; Wikipedia; Pet M.D..com; Westminster Dog Show; Pixa-Bay for information on this Post. 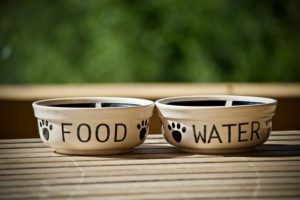 Author Barbara NelsonPosted on March 4, 2019 March 4, 2019 11 Comments on My-Pet-Toys-And-Stuff: Do Show Dogs Influence our Pet Choices? When I started this project, I had no idea it would expand to two articles. But when I began to put it together, I realized I had much too much material for just one article. So, both Cats and Dogs will get equal time. Personality wise, the dogs wouldn’t care or take offense, but the cats would expect equal time as their right. Today’s domestic cats descended from one small group of African wildcats, who domesticated themselves about 10,000 years ago. They were all gray tabby cats resembling today’s African Wildcats- which would indicate that this color gene is dominant and carries through from generation to generation. Feral cats in rural areas in Europe and the USA usually have the same fur patterns. You will notice that the rise of domestication in cats started much later than in dogs. Might be one reason our sweet little furry kitties sometimes act like crazy wild things. 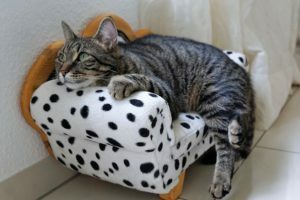 If you are a serious cat watcher, you might also see that every cat, no matter the color, or the circumstances of their lifestyle, believes that Royal blood courses through their veins. We are going to start with the cats that have coats of many colors: The Tortoiseshell and Calico. Torties have no white in their black, red, cream coats, while calicoes have a generous smattering of white mixed with black, red and cream. Torties and Calicoes are usually female; it is rare to find a male calico. Torties are vocal about everything. Calico’s are lively and loving. In Japan, Calico’s are thought to bring good luck. Orange cats- are more likely to be male- about one female to every five males is the ratio. These cats are lovable, but also assertive and aggressive. These male cats can also reach a good size–about ten to fifteen or more pounds and husky in build. 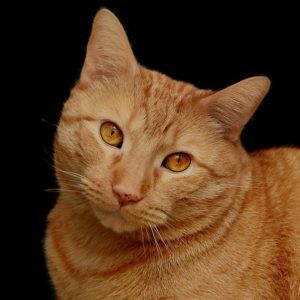 Red or Ginger colored cats are sweet, sassy and unpredictable. They may have the tabby markings as well. Gray cats are the sophisticates of the cat world-secretly they like to be let loose to let the wild side out. Tabby -these are lovers of the good life. They can be various shades of gray and black with the true lines and circles that label them tabbies. They are good-natured and friendly. 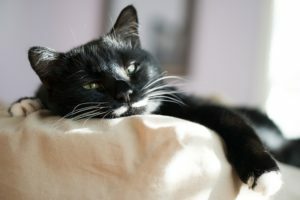 Tuxedo cats- They are always dressed for any party occasion-Black with white vest, four white feet, and some times a little white on the face, or white whiskers.They lovable, but independent creatures. If let out, they will roam far from home. Black cats– their personality traits are closely related to their wild ancestors. Black cats were first seen in the wild. They are unpredictable and can roam far from home. Chocolate Cats- are intelligent, playful, friendly and vocal. fact, many white cats are born deaf. 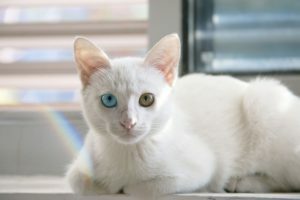 Some white cats are born with blue eyes, or one blue and one green eye. They may also have poor vision. For these reasons white cats are usually home body’s, electing to stay close to their owner and close to home. 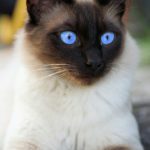 Siamese cats– Color Point and Seal Point- These cats are usually sleek in build, with long legs. They are assertive and vocal, to the point of driving you crazy. The muted colors, blue, cream, gray and lilac are usually the Persian cats. These cats are playful, mischievous,and curious. They will run from one end of the house to the other, chasing invisible prey. 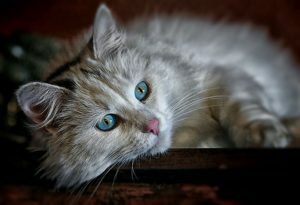 A couple of traits that are usually consistent in all cat color variations are the eyes and the white in almost all coats. Cats usually have green eyes or yellow eyes. The exceptions are the Siamese and the white cats with blue eyes, or one blue eye and one green eye. As to major colors, almost all cats have some white in their coats. Most usually the white occurs around the under side of the cat and the paws. Sort of looks like each cat stood at attention while someone poured paint over their backs, and as the color ran down their sides, it left the underside white, and missed the paws. Now after singling out these color coded cats, those of us who own cats know that there are as many color combinations as there are cats. I have owned a number of cats during my adult years. My first cat was a calico- female. She was a loving cat–to me. She wouldn’t tolerate anyone else. She barely tolerated my son and my husband. The vet got the spit and yowl treatment. My in-laws lived on a farm in the state of Kansas. Now, there are usually cats around the farm and my father-in-law’s farm was no different. There were plenty of cats around. Most stayed in the barn, to get fresh milk at milking time, and to keep the mouse population down. However, once in a while a cat ,or cats would catch my father-in-law’s eye, and they were promoted to life in the house. One summer when we were visiting, I noticed two orange and white cats up at the house that were unusual. They had almost exact color markings. One had a white blaze down his forehead and the other one was a boxer-that is he would stand on his hind feet and box with his front feet. I fell in love. My in-laws let us bring them home to St. Louis. My mother-in-law said she was sending them off to college. We named the one “Blaze” and the boxer-what else?-Ali. Blaze died from a kidney problem at three; Ali lived to thirteen. Jake came to live with me a few years later. Jake’s owner said she was allergic to him. I think she was scared of him. He weighed in at 16+pounds. He was gorgeous. All white long hair with a flowing black tail and a couple of black spots on his ears made up this cat from hell. He had been declawed and then let outside to fend for himself. He wanted to be petted and loved but I never knew when he would turn on me and scratch me with his hind claws. Finally, he figured out that it was just me and him and I wasn’t afraid of him, so we settled in together. Jake lived to be 16, and I’ll never forget him. The two cats I have now are sisters. Janie is a Tortoiseshell and Julie is a Tuxedo. I adopted them when they were about 2 years old. They are now 13. Janie is allergic to all kinds of foods that cats would normally eat. The only way she can keep food down is to take prednisolone every day. I keep a vaporizer going all day and night to keep her from sneezing her head off. Julie is smaller than her sister, but she actually rules the household. She plays all the time and runs through the house like a maniac She also is a nurse to Janie. Julie grooms Janie every day and sleeps next to her to keep her warm. 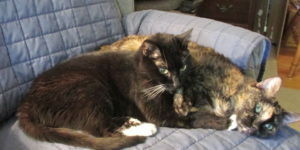 It is amazing to see the level of devotion the little tuxedo has for her ailing sister. Our pets can teach us something about living from day to day and in the moment. That is what they do. Each day to them is the only day to be concerned about. Forget about yesterday and tomorrow isn’t here yet. The only day we have any control over is today. Live in the now. I would love to hear from my readers. Let me know what you liked and what I missed. Information for this article came from: Cattime.com; The Thought Co.; Dog time.com; Dog Reflections, May 2008 by Dan; Pet Wellbeing; Pixabay.com. Every indoor cat needs a box with litter in it. It is an absolute necessity. However, it is usually the very last thing a new cat owner buys. You’ve got the cat, feeding dishes, water bowl, flea collar, sleeping bed, comb, brush, food- wet and dry. You’re on your way home when suddenly you panic. You don’t have a litter box or any Litter. Well how hard can that be? A cat box and Litter? How Many Kinds Can there Be? You stop at a pet store and are suddenly overwhelmed by all kinds of boxes: small ones, large ones, corner boxes, boxes with lids, self-cleaning boxes, all in variety of colors. Well, you make a selection, anything will do for now. You walk over to the Litter section and are shocked by the number and kinds of Litter. 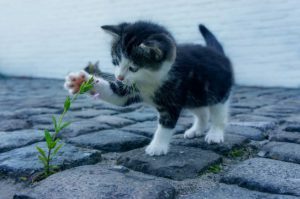 Clumping, non-clumping, scent controlled, low-tracking, no dust, low -dust, a variety of Litters now made from plants, and a litter that changes color so you can see whether your cat has an infection or not. You grab a bag, the cheapest, pay for your purchases and head home. What kind of box to get and where do you put it in the house? These are the main questions you have to answer before you go shopping. Cats want a box that is large enough to turn around in and do some serious digging and covering. They don’t care what color it is.That is your concern. Where will you put the box? Cats like a secluded area, away from household traffic. Also, cats need to find the box, and have an uncluttered path to it. If you put it in the basement, be sure the door is always open, or cut a cat door in the basement door so your cat can go through. There are on the market, cat boxes that have covers over them, presumably to give Kitty cat privacy. I don’t think your cat cares. Some will like the cover, some will not. Personally, I don’t fiddle with the extra lids. I think it is just that, something extra. You should consider, however, a box with high sides. Some cats like to scratch a lot, and the high sides will keep the litter inside the box. A corner box? That is personal decision. As long as the cat has full access, I doubt it will make a difference. You want a box large enough to accommodate a fair amount of litter and give the cat room to maneuver. There are many different kinds of litter, supposedly to cover many different kinds of problems. 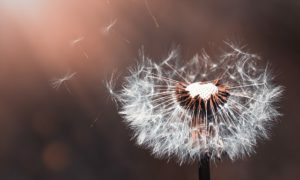 Basically, your cat just wants something to plant her business in, and proceed to hide it by covering it up .By the way, do you know why cats are so meticulous about covering? It ‘s a carry over from the wild. Cats cover, so that other cats and predators can’t track them. You want to pick out a clumping litter, it’s easier to clean out the box and Kitty doesn’t care. Don’t buy a scented litter. Some cats will refuse to use it. And you don’t want to deal with a cat that is not happy with her litter box. Be sure to get a low-dust litter. The dust from some litters can aggravate allergies for cats and for people. Litter can become a big expense. And obviously, you are always throwing it out, and getting more. So do some price shopping and buy the least expensive litter that has all the additives you need, and buy in large quantities. One company even has a refill program that helps the pocket book. You want to buy a clumping, low-dust, non-scented litter. Scoop out the litter box every day, at least once, and completely replace litter once a week. Wash the litter box with clear warm water, dry and refill. That way, you’ll never have cat box odors in your house or apartment. You also will have a happy cat that always uses her box. Every year, a few cats are returned to shelters,or given up to the Humane Society, or turned out of the house because of Litter Box problems. 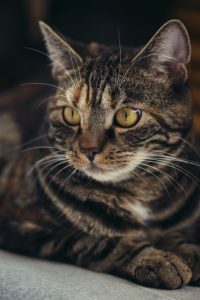 These problems stem from misunderstandings between cat and owner, and needs to be cleared up for the good of both. First of all,take a good look around the Litter box area. Is it kept clean? Is there anything that could upset your cat? An open window with outside noises, or a curtain flapping? Do you have another animal in the house, or small children ? These sound like crazy questions, but distractions will discourage your cat from using her box. A stray cat outside can upset your cat inside. If everything is clean and quiet around the Litter box area, then make an appointment with the vet for a checkup for your cat. She may have a urinary infection and, in her mind, the box may be causing her the discomfort. If that is ruled out, try a different litter. Be sure to clean the soiled area very carefully and put something over the area, so she can’t use it again. After checking all the above situations, you and your cat very likely have found the solution to the problem. Whatever you do, don’t resort to the old punishment of grabbing the cat, rubbing her nose in the soiled area and whipping her with your hand or a newspaper. That will only strike fear in your cat and it will do no good. She doesn’t equate the punishment with the mishap. Besides, it is cruel. It has been about a week now since you brought home your new beautiful, furry cat, and everybody seems to be settling into a routine.Your cat knows where everything in the house is located. She has picked out her sleeping place–not the lovely cat bed you bought her–at the foot of your bed. All is well. You have a loyal pet to keep you company for a good ten or more years. healthy cat, and the whole digestive system is the secret to good health. 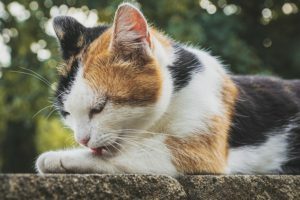 Author Barbara NelsonPosted on December 27, 2018 December 27, 2018 7 Comments on My-Pet-Toys-and-Stuff:What Makes My Cat Sneeze?